April 11th is National Pet Day and is also the day we celebrate the life of Jasmine the Wonder Dog. I don't think I had ever heard her bark before. She was two and she never barked! She ran back up the stairs and then back down and barked again like Lassie saying Timmy fell down a well. So I followed her. She lead me up the stairs and down the hall to my mom’s room. When I walked in the room, I found my mom in distress laying on the bed and Jasmine was beside her. When I saw my mom on the bed, I quickly grabbed the phone to call 911. She was having a heart attack! Now, you have to know, my mom was an independent sort and I was so busy following her oddly specific instructions for exactly which hospital she would like to go to (as she was having a HEART ATTACK!!) that my dog jumped in the car too. I forgot to bring anything for her (leash, bags, water... anything!). We sped to the hospital of my mother’s choice. My dad met us there at the hospital, a nervous wreck and shaken by all that had happened and needed something to do to keep him busy for a moment. He went to go take care of Jasmine. I’ll never forget the sight of him walking her around the hospital grounds using my apron from the pizza joint as a leash. She was already loved but she became a true member of the family that day. My mother was in for a long recovery, but she was going to be just fine thanks to Jasmine. Jasmine had saved her life. They always had a special bond from then on. A couple years earlier 1994 I was working a slow Sunday at pizza joint in Smyrna, GA, when a co-worker walked in with his new puppy. This puppy was an adorable fluffy brown little munchkin and looked like Chewbacca from Star Wars. I was instantly in love and asked him where he got her. Getting a dog was probably not the best decision for a 20 year old long haired punk college kid who worked full time and played in a rock band. But hey, what are college years are for, right? The next day I went to the house where my friend got his little fluff ball. The puppies ran up to me. I picked up the first little one and she stuck her tie-dyed tongue out at me. 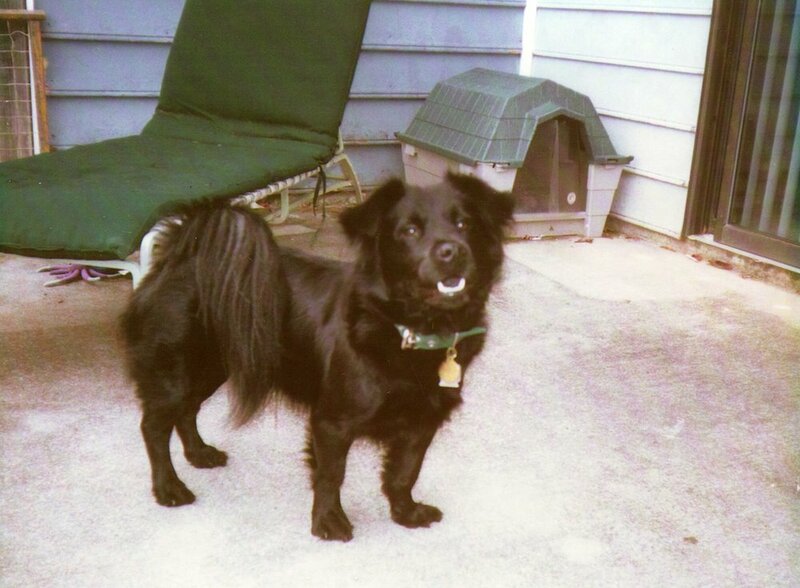 She was a Chow-Chow mix of some sort and had pink and black spots all over her tongue! I was sold. The owner said that the litter was an accident and they weren’t planning on having puppies. “She’s yours for five bucks”, she said. I handed her a crumpled $5 dollar bill and jumped in my 1980 Toyota Corolla and headed home to my apartment. On the drive home, the puppy threw up all over my lap. What on earth had I gotten myself into? Being a busy college student and preparing my apartment for the new pup took all my time and energy that first week I had her. I didn't tell them but I brought my little nameless fluff ball with me on my next trip home as a surprise. My sister named her Jasmine (from the Disney movie... it was the mid nineties after all). The next few months were filled with vet visits getting her puppy shots, getting her spayed, buying toys and other necessities for a rapidly growing pup. I think I probably spent $1000 that first year on vet bills and supplies. She was mine and I was determined to take the best care of her that I could. She seemed to know this and went easy on me. She never had “an accident” in the house. How was I blessed with a puppy that was potty trained from birth. I would learn over the next years that I was truly blessed to have Jasmine in my life. in 1995, I bought a townhouse. And the two of us moved in and lived like grown ups. I got a 'real job' at a real estate company and we spent our weekends hiking trails in central Georgia. One day, Jasmine started acting funny and coughing like she had something in her throat. I called my vet and they said that Chow-Chows can get hairballs like cats and to try hairball treatment which I did. One morning I woke up to find that Jasmine had thrown up blood all over, went out the dog door and was lying outside in the rain. Obviously, this was much more than a hairball. So I picked her up and raced her to the vet. My little life saver was about to have to fight for her life. The vet said that he believed that Jasmine had been poisoned. He asked me to go home and look for clues. I went home and looked over the back yard and there it was a large box of rat poison torn open and empty in my yard. The door to my storage was blown open and the rat poison was in there from the previous owner. Jasmine found it and ate the whole box! I took the box to the vet, crying, because I felt it was my fault for not throwing it away when I moved in. The vet was very somber telling me the amount she ate would be enough to kill a dog of twice her size. She was only 35 lbs. He said if I wanted to try and save her, he would do all he could, but it wasn't promising. But how could I not try to save her after all she was my best friend and she had saved my mom! The next few weeks she had numerous blood transfusions and was on a IV and stayed at the vet’s office. I visited her everyday. They told me that she would lay in her kennel until moments before I would show up each day and then she would try to stand up to greet me before I even walked in because she could sense I was coming. The next year she was taking daily vitamin K supplements to make sure her new blood would stay healthy. After maxing out all my credit cards and borrowing money, she was healthy again and my vet told me that she was now known as Jasmine the Wonder Dog because no one thought she would make it. In 2002 we moved to Charleston to start over. Life, being what it is, had thrown me some curves and I was anxious to try something new. We lived in a house on James Island with a cute fenced back yard and she still had her doggie door she loved so much. Jasmine however missed her hiking adventures. I discovered this when she started showing up at the FRONT door instead of being in the back yard. She started tunneling under the fence and going on “walkabouts” around the neighborhood a la Benji. She never went in the street, she would walk on the sidewalks and make a loop and come back and scratch at the front door to come back in. As annoying as this was, it was kind of cute as she just wanted adventure. She made friends with everyone in my neighborhood... except that one time animal control called. I fixed the spot where she would get out and started taking her to the local park or out to Folly Beach to walk. That fulfilled her need for adventure as she was getting older. In 2006 I had taken Jasmine in to the vet because she just wasn't herself. No energy, no appetite and she had a strong odor to her. It turned out to be worse than we feared. She had an oral melanoma... cancer. They gave me options but no guarantees. I made the difficult decision to not pursue radical treatment and to just have the mass removed. That made a HUGE difference in her quality of life. She was her old self again for a little while. She had two more procedures to remove more growth over the next THREE YEARS! Once again, everyone was amazed at Jasmine the Wonder Dog. My mother lived another decade after Jasmine saved her life. She got to meet her grandchild and to enjoy her retirement. We lost her in April of 2007 after a battle with cancer. 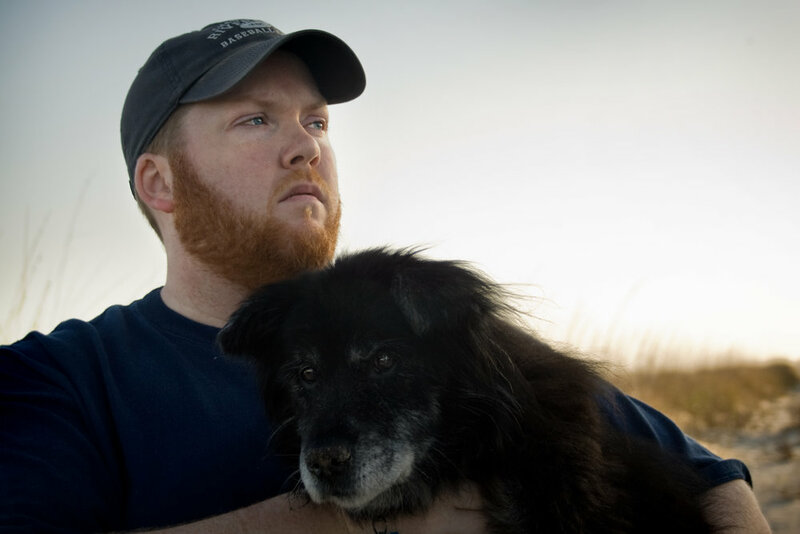 Just two short years after that in April 2009 I took Jasmine for her last walk on the beach she loved so much. The next day on April 11th of 2009, I took her back to Ohlandt and said goodbye to my best friend of the past 15 years. It was one of the hardest things I have ever done. This article’s cover photo was shot that day. A few months later, in July of that year I went to Pet Helpers Adoption Center for the very first time. You know, just to check it out and see what this adoption thing was about. I was NOT leaving with a dog. I walked around the adoption floor and didn't connect with any of the dogs there. I was headed for the door when a little blonde dog caught my eye. I walked over to the kennel she was in off to the side and looked for the information card. It said "Hello, my name is Peanut! "....the rest is another story.